Mr. Frost successfully reminded us what month it is this week, and to that we say, when life gives us snow, make a snowman. The top things to do this weekend are full of winter fun so bundle up and continue reading! As we wrap up the rest of January and Lake County’s Libation Month, treat yourself with a ‘winter warm-up’ at one of the 21 craft breweries, wineries and distilleries on the Lake County Libation Trail. We know it can be overwhelming selecting your next elixir excursion so we’ve creating a guide to 21 Irresistible Lake County Libations. Enjoy! Once you’ve dug yourself out of the wintry mess, treat yourself to one of the top things to do this weekend January 25-27! For all other events and activities happening this weekend, continue here. Lace up your running shoes and sprint to Half Day Brewing Company for the inaugural Frozen Tundra 5K. The out-and-back run along the Des Plaines River Trail begins and ends at the Lincolnshire Brewery and is followed by a post-race beach party with music from DJ Lou, craft brews, delicious bites, awards and more. 5K participants will receive a T-shirt, lei, sunglasses, gift cards, a finisher’s medal and more while supplies last. Not partaking in the run? Attendees may purchase tickets for the beach party separately. Learn more at Half Day Brewing Company’s Facebook page. Saturday, January 26; 10 a.m.-4 p.m. 5K and Beach Party admission: $45. Beach Party Only: $20. Half Day Brewing Company, 200 Village Green South, Lincolnshire. Love is in the air and the finest wedding vendors from around the area are at the DoubleTree by Hilton Libertyville-Mundelein this Sunday for the Lake County Bridal Show. Attendees can speak with more than 50 seasoned wedding-service vendors. Brides can to enter for a chance to win a tropical honeymoon vacation for two to Aruba, sponsored by 102.3 WXLC. Learn more at 1023xlc.com. Sunday, January 27; Noon-3 p.m. Free admission. DoubleTree by Hilton Libertyville-Mundelein, 510 E. IL Route 83, Mundelein. Come check out the Sleds Are Coming Event, sponsored by @northshoreweb, @salvilaw, and @hollister_incorporated. We will be at Lake Forest College on Sunday, January 27 from 2-4 pm! Join Lake @foresterathletics and @suzysswirl in supporting the GLASA Falcons Sled Hockey program! Witness an incredible display of athletics at “The Sleds are Coming…” hockey event at Lake Forest College Ice Rink. The free admission ice competition consists of three 12-minute periods of five-on-five sled hockey, featuring members of the Great Lakes Adaptive Sports Association (GLASA) Falcons. Attendees can participate in the Chuck-a-puck competition, meet two-time USA Olympics and Paralympic (2014, 2018) gold medalist Brody Roybal, enter the event’s raffle and bid on an array of silent auction items. Sunday, January 27; 2 p.m. Free admission. Lake Forest College Ice Rink in Alumni Memorial Fieldhouse, 555 N. Sheridan Rd., Lake Forest. Fine dining and invigorating entertainment are on the menu this weekend at the Illinois Beach Hotel’s Mystery Dinner. 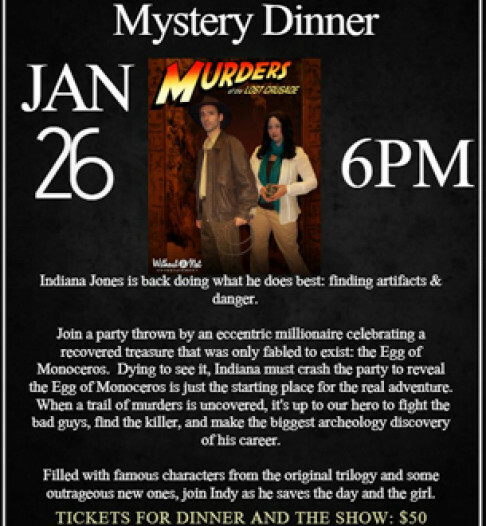 The Zion evening event features an action-packed plot led by protagonist, Indiana Jones, as a trail of murders is uncovered at an eccentric millionaire’s dinner party. Join Jones and the other beloved characters from the original trilogy as the esteemed archeologist “digs up” the truth behind the mysteries. Saturday, January 26; 6 p.m. Admission: $50. Illinois Beach Hotel, 1 Lake Front Dr., Zion. Glide, axel and twizzle over the frozen water at North Park this Friday for Lincolnshire’s Skate Night. The North Park icy event features fireworks, food trucks, frozen custard, beverages from Half Day Brewing Company, s’mores and free hot chocolate for children. Free skates are available at this family-friendly event while supplies last. Friday, January 25 Saturday, February 2; 6-9 p.m. Free admission. North Park, 1025 Riverwoods Rd., Lincolnshire.